Wednesday brought eleven new polls into the FHQ weighted averages from nine states. Nine surveys were newly released and two (from California and Georgia) were older polls from July that we are just adding in now. And yeah, collectively the new additions created some changes in our customary graphics. Nothing much to see here. The eleven point margin in the July PPIC poll is on the low side, but that was more a function of the Romney share being the highest he has garnered in any other poll of the Golden state than anything else. The Obama share in the poll was well within range of previous polls. Another day, another poll showing a slight Romney lead in the Sunshine state. The former Massachusetts governor has a number of these in recent days following a long dry stretch where Obama held small leads in Florida. The average does continue to creep closer to a tie. 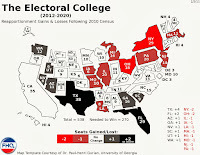 For those looking for FHQ's 332-206 electoral college outlook to change, Florida is the first state at which to look. The Peach state is hardly on the Obama wish list this fall. However, the two most recent polls included in the FHQ weighted averages have pulled the margin between the president and Mitt Romney under the 10 point Strong/Lean line into the Lean Romney area. Georgia is not consequential in determining a winner in the electoral college tally. It is a safe Romney state and fits well -- as it did down the stretch in 2008 -- in the lean area. Keep in mind that FHQ will change the parameters of these categories -- shrinking them -- as we approach election day. That will have the effect of moving Georgia into the strong category barring any continued narrowing in the Peach state polling. Well, the Bay state is a blue state. An argument could be made that this is a particularly lackluster showing for Obama there. That said, this PPP survey is not much unchanged from their last poll of the state earlier this year. In 2008, the margin was anything but big in Big Sky Country between Obama and McCain, but in 2012, the distance between the two contenders vying for the presidency is living up to that name. Consecutive Rasmussen polls have bumped the Treasure state into the Strong Romney designation. While there has been some polling volatility in New Mexico, the Land of Enchantment has just not swung back toward the Republicans (2008 vs. 2012) in the way that many other states have. There has been some shift in that direction, but not as much as we have more uniformly witnessed elsewhere. One footnote to New Mexico is that former governor and Libertarian Party nominee, Gary Johnson, has been included in a fair number of polls and has had some impact on any 2012 to 2008 comparison. It is good to see Rich Clark's (Castleton State) name pop up. He's an old hand for my UGA days. It is also nice to have the data from very blue Vermont to confirm what we all already knew: chalk those three electoral votes up for Obama. There is not much to add today to the picture in Wisconsin. The Marquette poll shows Obama ahead in the Badger state and while Wisconsin certainly tips in the president's direction, it is safe to call -- and the data backs it up -- it a toss up state. 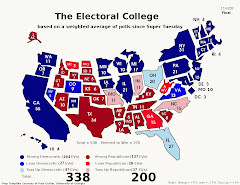 I won't belabor this too much, but despite the above changes, the electoral college count remains unchanged at 332-206 in favor of the president. 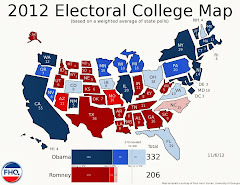 Of more consequence -- as alluded to above -- is the shuffling of states on the Electoral College Spectrum. 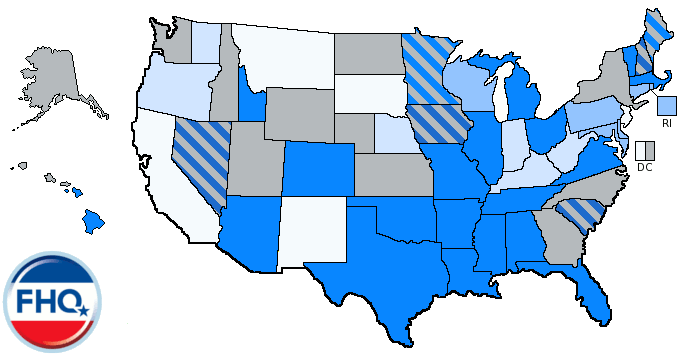 With additions of Michigan, Nevada and Wisconsin to the toss up category, the 2012 Spectrum has the look -- at least in terms of how the colors match up but to some extent the states as well -- to 2004. The terrain on which the presidency will be fought and won dominates the most competitive middle column, but has now drawn in the bottom portions of the second column from the left. I'll have more on this later. I had planned a post comparing the polling at this point in 2004, 2008 and 2012, but the week has filled up quickly. I hope to get to that before I head out for Tampa. New Mexico is off and Nevada is reassigned on the Watch List for today. There are a number of states that are on the cusp on entering the Lean Obama category, but as of now the number of states in that category has dwindled to two.